Robots have been a popular topic ever since the golden age of science fiction in the 40s and 50s when Isaac Asimov wrote his imaginative novels on robots and their code of conduct and initiated the innovative issue of artificial intelligence. ForEric Joyner, an American painter and professional illustrator, robots have been the major inspiration throughout his career and his entire body of work is dedicated to various sorts of old-school tin creatures. His characters are similar to legendary R2D2 from Star Wars or more recent star of the robot world, Pixar’s Wall-E. Joyner’s work is quite straightforward, narrative and realistic with a refreshing pop & sci-fi twist. Joyner was born in a suburb of San Francisco and he describes his childhood as quite uneventful. He was spending his time reading comics, playing sports, collecting toys as well as drawing and painting. Already as a child, Joyner was interested in eminent painters such as Van Gogh and decided to take painting lessons. When he was in the first grade, his classmates and teachers started to notice his talent and even some of his early artworks got significant awards. Encouraged and inspired by his instant success, Joyner decided to study visual arts at the Academy of Art in San Francisco. After the graduation, Joyner began working as a commercial illustrator and created the covers for several video games. His interest in sci-fi topics became much more prominent by 1999 when Joyner decided to base his art on his childhood hobby and never forgotten passion, which were Japanese toy robots. 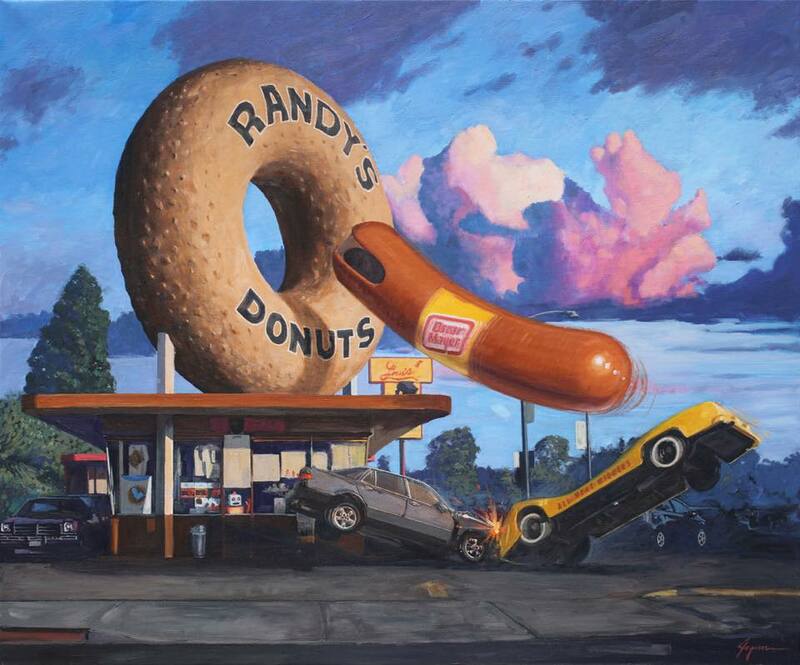 The other recurring motif in his art, donuts, showed up a little bit later after Joyner felt that he needs one more distinctive, key element in his work. Inspired by the movie Pleasantville and the scene in which one of the characters is painting donuts, Joyner introduced donuts to his already unique and fanciful sci-fi compositions. The result turned out to be quite successful, a little bit bizarre but above all visually appealing. When it comes to creating his pieces, Joyner is usually inventing a unique visual concept first. Later on, he does some research if necessary, followed by taking photos of his tin toys and creating sketches based on the photos. He uses a baltic birch as his canvas and paints it with gesso before transferring the drawing onto it. Even though he uses oil colors as his main medium, he always makes an underpainting in acrylics, to make sure everything is at the right place before working on the final version of his piece. Joyner’s routine is well-planned and strategic, just like his paintings, which are highly detailed and precise, yet infinitely playful and able to bring the viewer back to the early childhood days and the unforgotten magic of old-school entertainment. 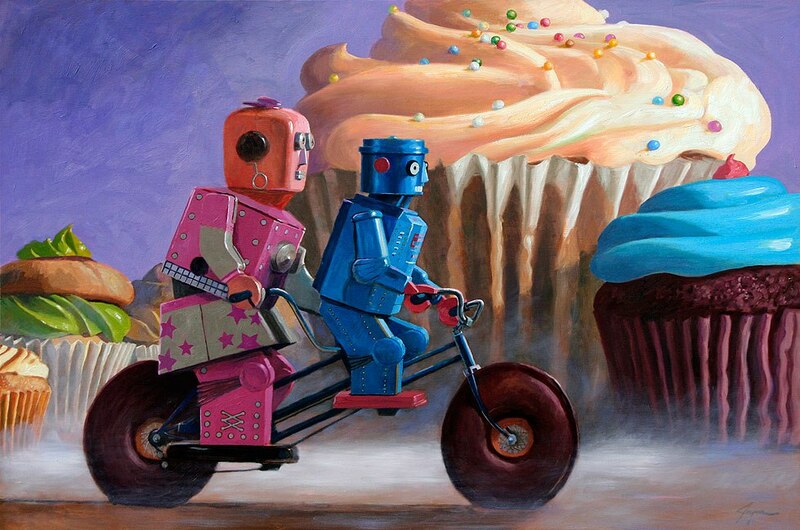 Also, it is interesting to observe the relationship between robots and donuts in Joyner’s work. The donuts are represented as both objects of desire and enemies of the robots and there are constant fights and chases going on between them. At the same time, no one is represented as the definite, final winner in this hilarious war and the circle of fighting goes on and on, shown in numberless colorful scenarios. This is the reason why Joyner’s paintings are highly dynamic and always fun to look at. Before concentrating on robots and donuts, Joyner was painting San Francisco urbanscapes, various cartoons characters, and Mexican masks. He chose to focus on the tin robots not only because they were one of the trendy topics at the time but also because he felt that robots would introduce a lot of possibilities and novelties when it comes to the diversity of scenes and characters, especially after he added the motif of donuts. By 2007, Joyner already entered many juried shows, had more than 20 solo and group exhibitions and his work was getting much more public exposure. At the same time, his paintings were becoming more complex and he started to depict huge, hilarious battle scenes, resembling the action frames in thrillers or sci-fi movies. Joyner’s paintings went viral after being used in the famous TV show The Big Bang Theory. Also, the adaptation of his artworks Collator and Submergedgot featured on the album cover of the Ben Folds Five’s The Sound of the Life of the Mind, which brought Joyner an outstanding media recognition. His humorous and light-hearted style which isn’t overly concerned with pressing social or political topics appeals to versatile audiences – to those who were growing up at the time of early sci-fi books as well as those raised on Japanese and Western modern animation. Beyond a long list of gallery exhibits, Joyner’s work has been used in films, computer games, books and humorous commercials.